Grieving the loss of a Loved One is different for everyone. 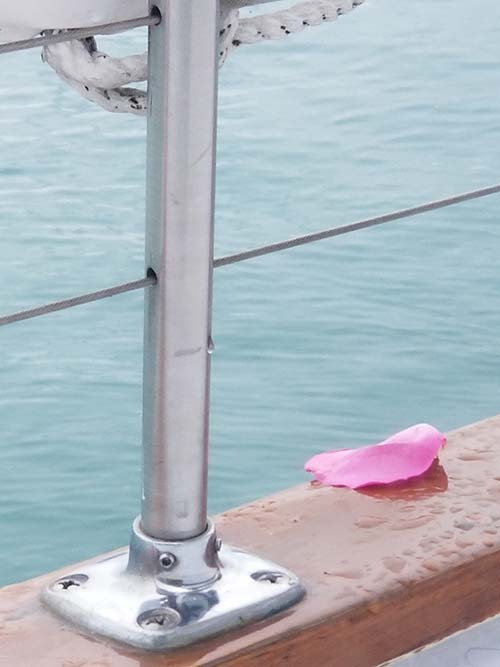 Chicago Private Yacht Rentals dignified “Burial at Sea” scattering of ashes on Lake Michigan options offers a thoughtful way to remember your Loved One and a healing experience for you, your family and others joining the tribute to the life of a person you all loved and cherished. The scenic backdrop of Chicago’s Skyline on one side, the serenity of the horizon on the other and the sky bridging the two offers a remarkably peaceful setting to scatter the ashes of your Loved One on the welcoming waters of Lake Michigan. Honoring and healing begin upon boarding Adeline’s Sea Moose. Unlike traditional wake, service and after the funeral gathering, where you may be sharing space with strangers, Adeline’s Sea Moose provides 68-feet of privacy, comfort, and convenience to offer respect, lay-to-rest and celebrate your Loved One. Also, our Captain’s and Family Memorial scatting of ashes on Lake Michigan services can cost much less than traditional funeral services and we respectively feel, the experience would certainly offer much more. Samantha, Our family experience with the captain and crew on the lake last week was close to perfect. We motored through grey water and drizzle. The captain’s decision to stop right where Mother grew up on Lake Shore Drive was inspired. The crew showed us kindness as we struggled with letting Mother go and leaving her behind. The petals, all 300 were perfect, especially as they lightened the mood and scene with their color on the grey lake. We appreciated the comfort of the boat and your attention to this significant event for our family. Please communicate to the captain and crew that their service on Friday was greatly appreciated. We appreciate that this is most likely a difficult time for you and that you may have a number of questions. Please feel free to call us at (224) 601-0220 or use the follow form. A “Burial at Sea” on Lake Michigan during a releasing of ashes ceremony can be a cathartic ritual. It’s a symbolic way of saying goodbye and letting go. And with cremation rates rising, ash releasing ceremonies are also becoming increasingly popular here in Chicago. Water symbolizes a cleansing of the soul, freedom, and the natural flow of life. There are several ways you can build upon a water releasing ceremony. Some ideas include using flower petals or a flower wreath to help you visualize the remains as they drift away. Another idea is to make small boats from biodegradable water-soluble paper and put small amounts of the remains in each boat and watch them drift away. Releasing a small flock of doves when the ashes are scattered can create a beautiful and symbolic ceremony. Doves symbolize feelings of love, peace, hope, the Holy Spirit, and the freedom of the soul. In many places, experienced handlers are available to assist with the ceremony. After the ceremony, you also can keep dove feathers to remember your loved ones Burial at Sea service. 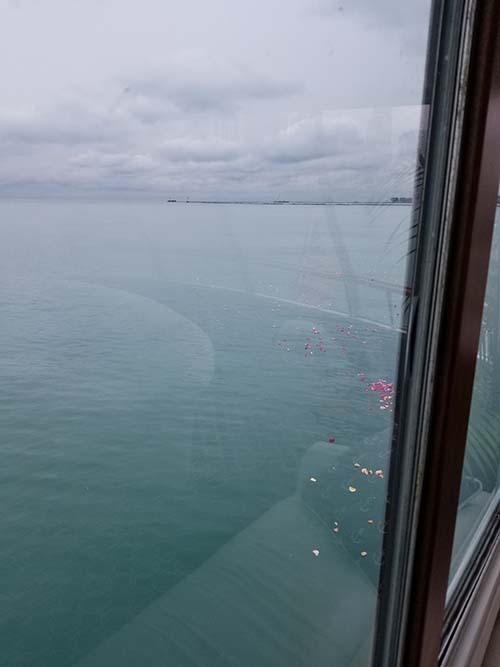 For families who can not attend a scattering of their Loved One’s ashes on Lake Michigan service, an Adeline’s Sea Moose captain will bring the cremated remains on the tranquil lake voyage for you and perform a dignified and documented Lake Michigan scattering of ashes, with that documentation provided to you. While the Captain’s Service does not provide for the family or guests to accompany the vessel, specific requests, such as dates or times, special prayers or simple ceremonies are often available. Special planning, however, can add to service costs. 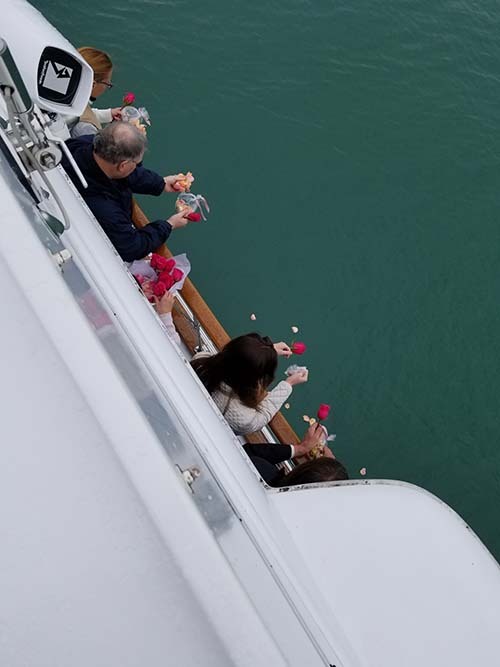 For those families wishing to plan their own scattering of their Loved Ones ashes on Lake Michigan memorial voyage, Chicago Private Yacht Rentals provides Adeline’s Sea Moose and her crew to be of service to you and up to 39 guests. Our always respectful and attentive staff will help you plan every detail of this special memorial, including food and beverages, and will work closely with you to insure your maritime memorial occasion meets your desires and is memorable for all.